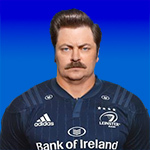 babbling brook, the leinsterfans.com supporters forum • View topic - In Andy we trust. Re: In Andy we trust. It’s a big show of faith to let his first head coach job be our biggest job, but you’d have to think that some smart people, including Joe, have given it their imprimatur. And he’s showing faith in himself too, going on stsge right after Streisand! But honestly I cant think of one reason to suppose he won’t be a good head coach. England were mad to let him go. Agreed. I think it's bullish of the IRFU to give him the job without any prior experience and getting it will be a poisioned chalice after Joe, but he's a wily operator and seems to know his business well. I hope he does great but with cavets. That Lancaster is joining the team under him though strikes me as a weird decision. It could lead to tensions etc and the team don't need that. If he didn't think he could work with Andy then he simply wouldn't sign up. Losing Joey is one thing but losing a top quality coach is quite another - probably better discussed in the Leinster section. Are we taking a few rumours on Pundit arena as proof that Lancaster is off to the Ireland gig? Or did I miss an announcement? johng wrote: Are we taking a few rumours on Pundit arena as proof that Lancaster is off to the Ireland gig? Or did I miss an announcement? Thats where the info is coming from!? I saw it on the42. If it's on pundit arena then I don't think we have to worry. Last edited by sunshiner1 on November 28th, 2018, 9:14 am, edited 1 time in total. TBH and TBF it's more like speculation than rumour mongering and quite reasonable under the circumstances.